As Americans, we spend a lot of our time at work — which makes it easy to fall into some unhealthy ruts. The good news is that healthy decisions have a way of adding up, and promoting wellness in the workplace can be as easy as encouraging smarter choices every day. 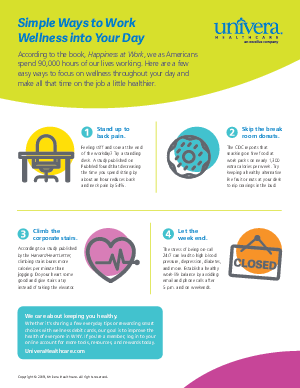 This one-page handout shares a few simple ways employees can make wellness a part of their workweek routine. We care about our community and want to do all we can to help Western New York continue to thrive. Whether it’s sharing quick tips like these or offering a creative take on wellness rewards, we’re here for you with the tools, resources, and guidance to keep your employees and business healthy and strong. Copyright © 2018, Univera Healthcare. All rights reserved.